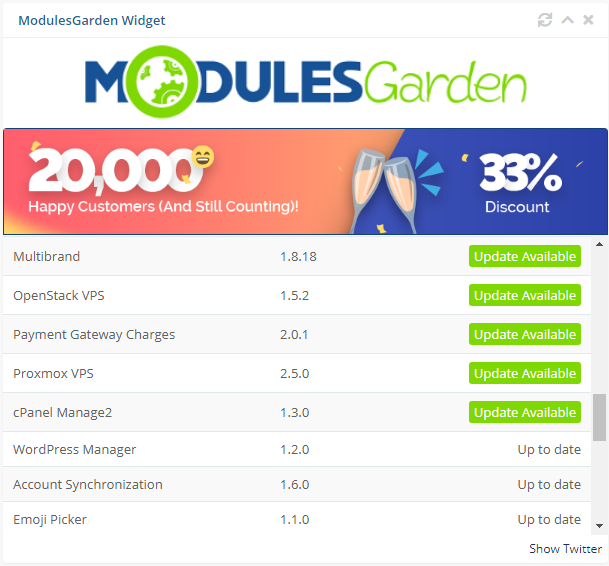 ModulesGarden Widget For WHMCS is a free tool that allows easy monitoring of the latest news, updates and promotions in ModulesGarden. Download it and activate not to miss any notification from ModulesGarden team ever again. ✔ No Installation Required - Upload, Activate And Use! 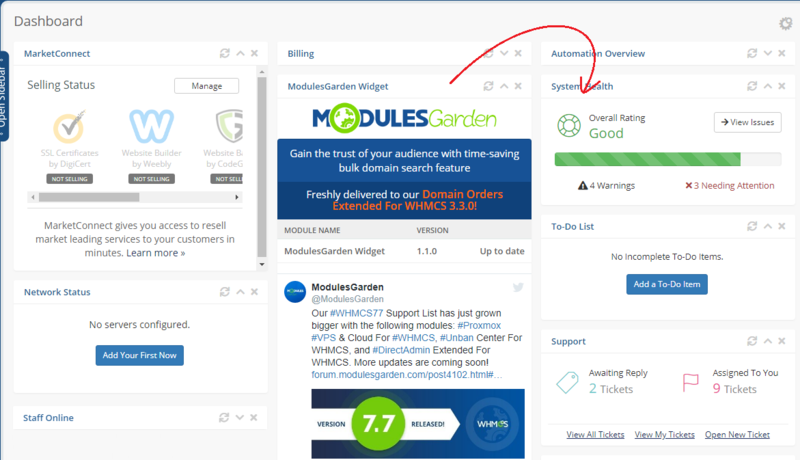 This tutorial will show you how to successfully install and activate ModulesGarden Widget For WHMCS. 2. As presented on the screen below, the first one is dedicated to PHP 5.6 up to PHP 7.0, while the second one is aimed at PHP 7.1 up to PHP 7.2. Note: You can check current PHP version in your WHMCS. To do so proceed to 'Utilities' → 'System' → 'PHP Info'. 4. If you want to slightly adjust the final look of the widget, open the 'widgetConfig.json' file located at /modules/widgets/ModulesGardenProducts directory. priority - define the widget priority among other widgets - the lower the number, the higher the widget will be located on the dashboard. Note 1: Refer to Tips section point 3 to learn how to define priorities in WHCMS. Note 2: WHMCS 7.7. supports the "Drag&Drop" feature so if you are using this version or any later, you do not need to set the position in the file, but simply move the widget on the dashborad. productListHeight - define the widget list of products length - you may decide how many products will be visible, the rest of them will appear when you scroll down. The value is provided in pixels. Congratulations! Your widget is now ready and active on your WHMCS Dashboard page! 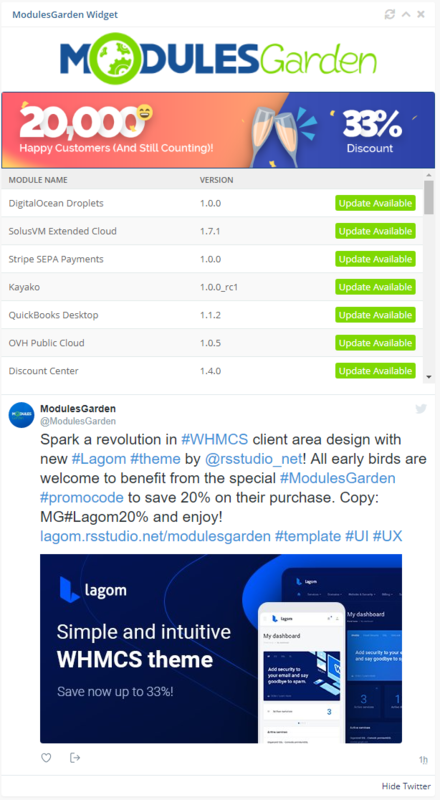 ModulesGarden Widget For WHMCS allows you to hunt for attractive promo codes, check if your modules are up to date and even track our latest Twitter posts. The widget offers a quick view on news we want to make you familiar with and gives you a quick preview on your installed modules from our offer. If there are any new versions available, you will find out first! Show 'Twitter' to see the latest post from our most popular social media site! It will let you track every news without the need to follow external social media sites. Finally, use the inbuilt WHMCS Drag&Drop feature to easily change the widget position and make it most easily accessible as possible. Simply press and hold the widget, move wherever you need and drop. Changes will be saved immediately. Important: Keep in mind that this feature is available in WHMCS 7.7. and later. 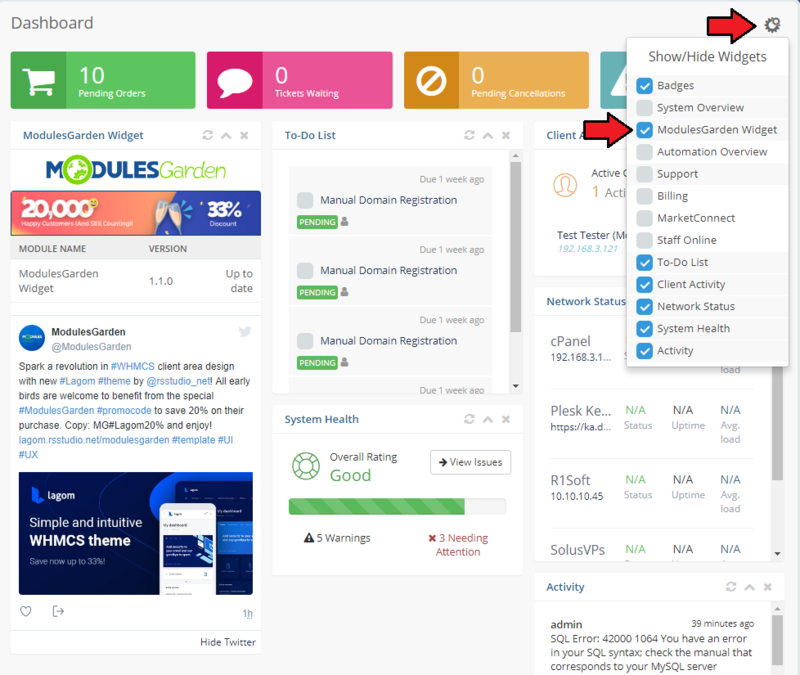 If you are using any previous version of WHMCS, change the widget priority to manage the position on dashboard as described in step 4. 1. Plenty of promo codes and promotions that we offer to our clients are shared via the widget only. It is really worth having it in your WHMCS if you do not want to skip any. 2. 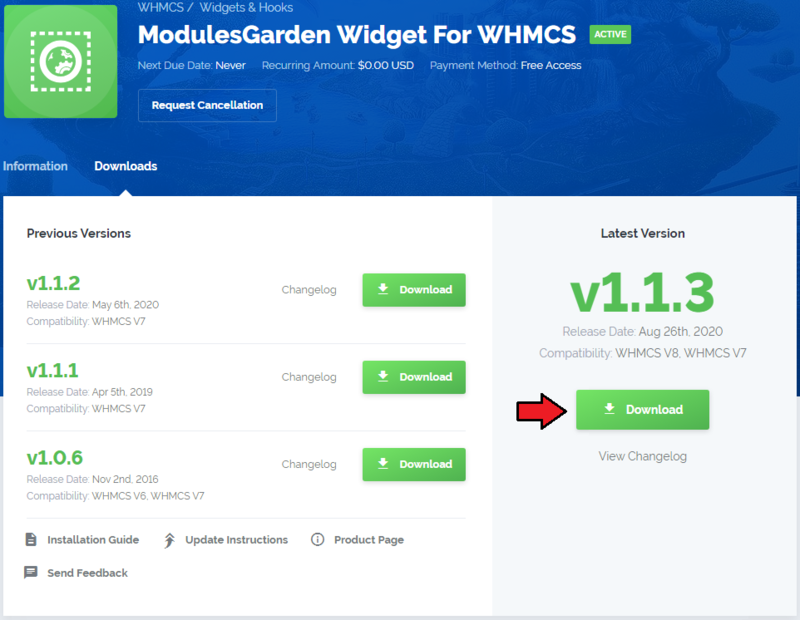 If you want to temporairly hide the widget, simply press the configuration icon at the WHMCS Dashboard, find ModuleGarden Widget and unselect it. 3. By default, WHMCS widgets priorities are graded every 10. This means that the first WHMCS widget in line has a priority 10 assigned, the second 20, etc. If you want to place the ModulesGarden widget on the first position, its priority must be lower than 10. The second position requires proiority number set between 11 and 19, and so on. Please remember that priorites to set the widget position must be used only if you are using any version of WHMCS previous to WHMCS 7.7. which now supports an easy "Drag&Drop" option. This page was last modified on 5 March 2019, at 10:20. This page has been accessed 29,361 times.